Ca' Vendramin Calergi is a palace on the Grand Canal in the sestiere (quarter) of Cannaregio in Venice, northern Italy. Other names by which it is known include: Palazzo Vendramin Calergi, Palazzo Loredan Vendramin Calergi, and Palazzo Loredan Griman Calergi Vendramin. The architecturally distinguished building was the home of many prominent people through history, and is remembered as the place where composer Richard Wagner died. Currently, it is home to the Venice Casino (Casinò di Venezia) and the Wagner Museum (Museo Wagner). Ca' Vendramin Calergi in 1870, photograph by Carlo Naya inscribed to Marie-Caroline de Bourbon-Sicile, duchess de Berry (1798-1870), its former owner. Ca' Vendramin Calergi was designed in the late 15th century by Mauro Codussi, architect of Chiesa di San Zaccaria and other noteworthy churches and private residences in Venice. Construction began in 1481 and was finished after his death by the Bottega dei Lombardo in 1509. The twenty-eight-year period it took to complete construction is considered short based on the technology available at that time. The spacious Renaissance-style palace stands three-stories high with direct access to the Grand Canal available by gondolas. The beauty and balance of the building's façade are exceptional. Classically inspired columns divide each level facing the canal. Two pairs of tall French doors divided by a single column topped by arches and a trefoil window rest above the doors on the piano nobile and upper levels. Opulent paintings, sculptures, and architectural details originally filled the building's interior. Baroque master Mattia Bortoloni decorated the ceilings of many rooms. The palace is locally known by the nickname "Non Nobis Domine" ("Not unto us, O Lord"), which is engraved in the stone under a ground-floor window. Portrait of the Vendramin Family (1543–47), painting by Titian. Andrea Loredan, a connoisseur of the fine arts, commissioned the palace, which was paid for by the doge, Leonardo Loredan. In 1581, the Loredan family suffered financial difficulties and sold it for 50,000 ducats to Julius, Duke of Brunswick-Lüneburg, who had deep affection for Venice. 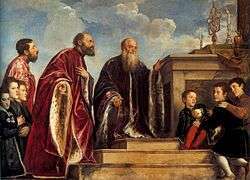 However, the duke kept it only two years before selling it to Guglielmo I Gonzaga, Marquis of Mantua, who then sold it to Vittore Calergi, a Venetian noble from Heraklion on the island of Crete. Calergi greatly expanded the building in 1614 with a large addition by architect Vincenzo Scamozzi called the "White Wing" which included windows overlooking a garden courtyard. (The addition was demolished in 1659 and rebuilt the following year.) In 1739, the palace was inherited through marriage by the Vendramins, a powerful patrician family of merchants, bankers, religious leaders, and politicians, who owned it for more than a century. In 1844, Marie-Caroline de Bourbon-Sicile, Duchess of Berry, and her second husband, Ettore Carlo Lucchesi-Palli, Duke della Grazia, purchased Ca' Vendramin Calergi from the last member of the Vendramin family line. 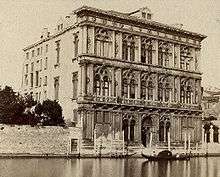 In the turmoil of the Risorgimento, they were forced to sell the palace to Caroline's grandson, Henry (Enrico), Count de' Bardi, and many of its fine works of art were auctioned in Paris. Count de' Bardi and his wife Infanta Adelgundes and the related Dukes of Grazia maintained the home and hosted many famous names of the day. In 1937, the last of the Grazia nobles, Count Lucchesi-Palli, sold it to Giuseppe Volpi, Count of Misurata, who remodeled the living quarters and turned it into a Center for Electromagnetic and Electrical Phenomena. The City Council of Venice purchased Ca' Vendramin Calergi in 1946. Since 1959, it has been the winter home to the celebrated Venice Casino (Casinò di Venezia). 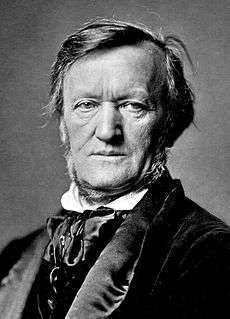 The composer Richard Wagner stayed in Venice six times between 1858 and his death. He arrived in Italy on his final trip not long after performances of his opera Parsifal premiered at the second Bayreuth Festival. He rented the entire piano nobile (mezzanine) level of the Ca' Vendramin Calergi from Count de' Bardi before his departure and arrived on 16 September 1882 with his wife Cosima Liszt, four children (Daniela von Bülow, Isolde, Eva and Siegfried Wagner) and household servants. The Wagner Museum (Museo Wagner) opened at the palace in February 1995. It holds the Josef Lienhart Collection of rare documents, musical scores, signed letters, paintings, records, and other heirlooms. The holdings constitute the largest private collection dedicated to Wagner outside of Bayreuth. The museum is open to the public on Saturday mornings by appointment. The Associazione Richard Wagner di Venezia operates the museum and the Richard Wagner European Study and Research Center (Centro Europeo di Studi e Ricerche Richard Wagner - C.E.S.R.R.W.). It also holds exhibitions, conferences, and concerts, and publishes scholarly papers that promote the life and works of Wagner. The International Association of Wagner Societies also holds a symposium called "Wagner Days in Venice" (Giornate Wagneriane a Venezia) at the palace each autumn. ↑ Portale di Venezia: Ca' Vendramin Calergi, downloaded 2 December 2008. 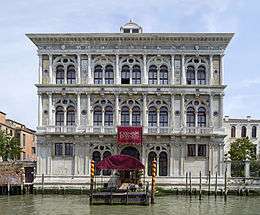 ↑ Casino di Venezia: Wagner Museum, downloaded 2 December 2008. ↑ Richard-Wagner-Verband International, Giornate Wagneriane a Venezia, "Wagner Days in Venice"
This article is issued from Wikipedia - version of the 6/3/2015. The text is available under the Creative Commons Attribution/Share Alike but additional terms may apply for the media files.